Madison Country Day School is offering a unique learning opportunity for academically talented students in grades 3 through 8. 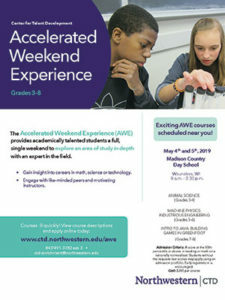 In collaboration with Northwestern University’s Center for Talent Development, the Accelerated Weekend Experience (AWE) program provides challenging, hands-on, in-depth exploration for those passionate about the subjects of science, technology, and engineering. The two-day AWE courses will be held at Madison Country Day School, 9 a.m.–2:30 p.m., both Saturday May 4 and Sunday May 5. High-ability students often need and want additional challenge to augment their schoolwork. With many activities to juggle it can be difficult to commit to an out-of-school program that may last weeks or longer. The concentrated Accelerated Weekend Experience is an excellent option and we are pleased to make this opportunity available. Can cows have twins? Can chickens actually fly? What does it really mean to be domesticated? In this hands-on animal science course, students learn about the various services humans use animals for and explore how we keep animals safe and healthy under our care. Using their newfound knowledge, students devise and build models of effective, humane animal dwellings, and design their own futuristic domestic species perfect for farm life. How do engineers create a high-flying projectile, explore an earthquake or improve a parachute? In this hands-on course, explore the concepts of physics and engineering that influence the design process. Through individual and group projects, students dive into physics concepts such as force, friction, momentum, impulse, and potential and kinetic energy, and see how they are applied to science, industry, and everyday life. Learn about the Java programming language using Greenfoot, a Java-based coding environment. Using basic Java concepts and design strategies, students create interactive media projects and learn about object-orientation and the class-object structure. Applying Java’s class libraries and syntax as they develop game projects that they can share with friends or online, students write methods and develop algorithms. This class introduces foundational programming concepts that students will encounter in AP computer science coursework. Eligibility guidelines and the online application are on the CTD website at www.ctd.northwestern.edu/sep/program/awe. Tuition and fees total $265 for each 2-day course, and financial aid is available—see website for details. Wow. What an amazing opportunity !